Shared Proxies: The Wide Usage and Reliability - Microleaves | Proxy Services! Shared proxies have a wide usage around the world. But what is shared proxies? How do you obtain these? And how do these proxies work? All these answers can be found if you read carefully through the product descriptions. In addition, you can opt for reading the reviews of regular users. The concept of shred proxies is that your proxy is being used by another person too. It is not just exclusive to you. The shared proxies have come under question for their privacy. How can you be sure that you are leaving no traces? If your proxy is being used by someone else, are you really secure? The answer is; yes, you are safe. There can be certain issues, but generally, privacy is not breached. The major issue that you can face is a slow internet connection. 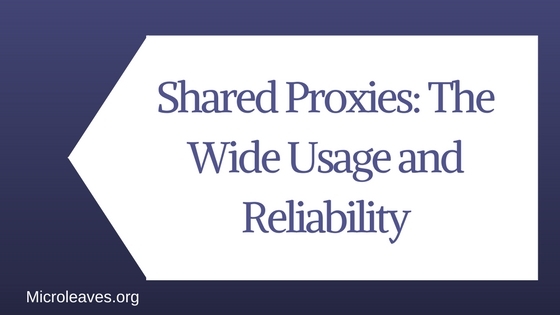 Apart from providing a secure connection, the shared proxies are also cheaper than other proxies. This provides a good incentive to the regular proxy users. The usage of proxies determines the proxies you choose. There exist a variety of proxies. Choosing the most appropriate is your own task. Those who have a constant usage and require speedy connections may use the other proxies. Although the shared proxies are used widely, it is important to note that exist certain drawbacks. The most troublesome issue of these proxies is their effect on the internet speed. Such proxies tend to put a higher load on your connectivity. Hence, the speed of browsing becomes slow and lousy. In addition to the internet connectivity, the network does not remain private. Although the concern of tracking is not very large, but the privacy of the network is still a question. If your IP is being shared by others, there is chance that you might be faced with certain troubles. These include safe browsing and connectivity. Too many users at once may result in denial of service. The Microleaves shared proxies are unique and quite different from the other proxies. Their shared proxies are not what you expect. These are different in the sense that they are private. There is no threat of denial of service as your proxies are not widely distributed. Not only is your connection secure, but so is browsing on the internet. It all just becomes extremely smooth when you choose the Microleaves shared proxies. In addition to the mentioned benefits, your internet speed is also maintained. The Microleaves shared proxies do not slow or dampen your internet connection. Everything works as smoothly as before. It is necessary that you take precautions. Similarly, it is absolutely essential that you select the best option. So, choose Microleaves if you want the best private shared proxies. Overall, shared proxies enable you to browse safely. In addition, the websites having cookies fail to track your browsing history. This is one of the major motivations behind using proxies. The only drawbacks are the internet connectivity and usage. This can be resolved if you choose the most efficient service providers. To ensure the best connectivity, the Microleaves proxies are the best. ← Why do you need Premium backconnect proxy?